On the basis of the very similarity in the system concept of FCIPS (Flexible Computer-Integrated Production Structure) with that of smart factory, this book describes the effective application of the system technology, know-how at the factory floor, human resources and so on, which have been so far accumulated by our long-standing experiences in the design and use of FCIPS, to the smart factory. To ease of understanding, both FCIPS and the smart factory are first represented by the human-mimetic model, and in consideration of the very importance of “Limbs and Tools” in the production activity, then the book discuss concretely the capability for converting FMC (Flexible Machining System) for “One-off Production with Keen Cost” to CPS (Cyber Phisical Systems) module in the smart factory. Importantly, such an FMC may be facilitated by the “Highly Function-Integrated Machine Tools”. The book states quickly the fundamental knowledge about the production systems in general, and reviews furthermore the present and near future perspectives in FCIPS and also some representative case studies on the smart factory. Of special note, the book suggests the research and engineering development subjects as well as those related to the manufacturing culture and industrial sociology for further convenience of people in academia and industry. CHAPTER 1 Of quick notes, the “Flexible and Intelligent Factory System”, exactly calling the FCIPS (Flexible Computer-Integrated Production Structure), and its variants are in the leading position of the production system of wider scope at present, and can facilitate the production activities in the industrial nation to a large extent. In contrast, a recent upheaval in the production activity is the smart factory, which is one of the flagship projects within the “Industrie 4.0” Programme initiated by the German Government; however, nearly all discourses, discussions and suggestions of the smart factory have been carried out without any considerations of FCIPS (refer to Preface for details). This chapter describes first the definition of and fundamental knowledge about FCIPS, and then its present and future perspectives, extremely suggesting its wider availability for various production activities in the localised globalisation area, e.g. in the form of the “Virtual Concentration of Production Bases”. In addition, for ease of understanding, FCIPS is detailed and visualised quickly by using the “Production Morphology (Life History of Product)”. Obviously, FCIPS can be facilitated considerably by the manufacturing culture and we see the same story in the smart factory. It is furthermore notable that the authors assert the similarity of both the concepts in FCIPS and smart factory, and duly suggest the better convertibility of FMC (Flexible Manufacturing Cell; Small-sized FMS) for one-off production into the CPS (Cyber Physical Systems) module in the smart factory. CHAPTER 2 A product is to be in reality by integrating a group of parts, and thus the kernel of FCIPS is, needles to say, the manufacturing system (Limbs and Tools). The manufacturing system consists, in principle, of processing, assembly and inspection procedures. In discussing the production activity, thus, it is extremely important to place the stress on the processing system. To suggest first the importance of understanding the hierarchical structure in the production system, Chapter 2 demonstrates (1) the differing aspects between the machining and assembly systems, and also between FMCs for metal cutting and metalworking. In contrast, we may suggest the configuration similarities between FMCs for machining and assembly. Although we can use various processing methods, the major is part machining, and then to clarify the characteristic features of the machining system, Chapter 2 describes (2) a classification of the machining system in consideration of the production pattern (mode) like “Much Variation and Small Volume Production”, (3) some representatives ranging from the production cell and transfer line to NC transfer line, and also (4) the input and output for both the material and information flows in the machining systems. CHAPTER 3 We must use various machining systems depending upon　technological, economic and social environments in the nation and region across the whole world, and within the industrial nation, FMS (Flexible Machining System) and its variants like FMC (Flexible Machining Cell) and FTL (Flexible Transfer Line) have been prevailed. Importantly, FMC and both FMC-integrated FMS and FTL are growing their importance almost daily, whereas we must modify the design guide for FMS and concerns so far used in consideration of their present and near future perspectives. In fact, the traditional design guide becomes obsolete with the advance of FMC. This chapter describes first the definition of FMS after classifying the applicable area of FMS and its variants at present, and then shows some representative FMCs especially placing the stress on the (defacto) standardised FMC, and also FTLs in consideration of its importance within the motorcar industry. In this context, it appears that FMC for one-off production is available for the CPS module in the smart factory, provided that the cell controller should be contrived something necessary. In consideration that both FMC and FMS are modular-designed to be facilitated the flexibility, expandability and redundancy, the basic knowledge about the design for FMC is also stated. It is furthermore important to enhance FMC by incorporating the function-integrated kinds in the machine tool, and thus a quick note for such kinds is given, where the transfer centre, i.e. a forerunning trial of such kinds, is discussed. CHAPTER 4 In the system design, there are two ways, i.e. top-down and bottom-up methods. In general, we used to design the system by the bottom-up method, in which we can purchase widely the system components necessary from the market through the supply chain, and we are capable of integrating them into a system or cell in accordance with the design specifications. In the very rare case, we design the system in a top-down manner, although we need to develop some new system components, if necessary. Importantly, in both methods, primary concern is the modular design, and thus this chapter describes the system components generally available for flexible machining in consideration of the determinants for system configuration and layout. In this context, the chapter places the stress on the system components for machining, transportation and storage, and for ease of understanding delineates their classifications in the form of first-hand view and gives a quick note for each component. In addition, the system component for main machining is explicated in detail considering its present and near future perspective, and it is notable that the chapter clarifies to what extent FMC, FMS and FTL can be characterised by the system component for main machining together with pre- and post-machining. CHAPTER 5 We have certain symptoms, in which FMC for one-off production is being established, and in due course, we can expect to apply such an FMC to the CPS module in the smart factory. Paraphrasing, we may verify the validity of our hypothesis to a large extent that FMC for one-off production with keen machining cost may be converted into the CPS module in the smart factory. For further verification, thus, this chapter reviews the present perspectives of the smart factory together with conducting the necessary discussion. 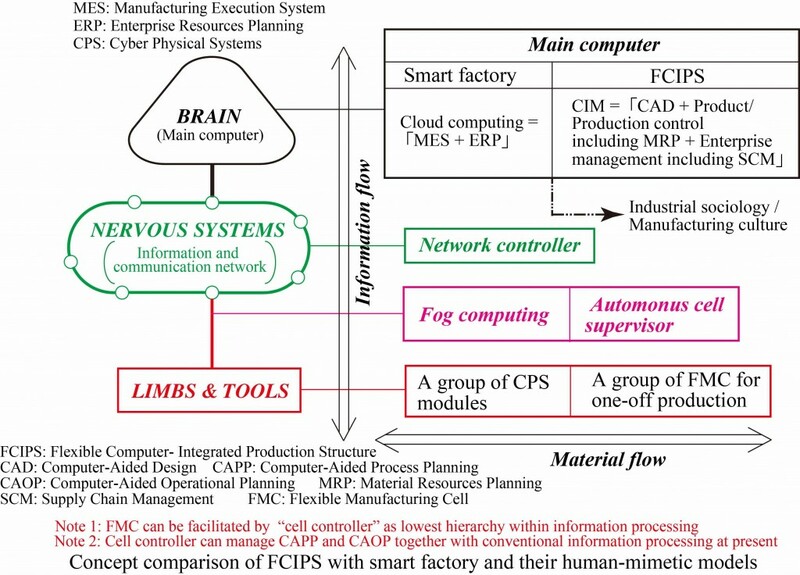 In the review, the smart factories being on work are classified into those of (1) “Brains, Nervous System and CPS module”, (2) “Brains and Nervous system”, and (3) “ Limbs and Tools”　types (see Fig. 1.9). In due course, we can find the considerable number of interesting smart factories, and of these, those of Volkswagen and Bridgestone are very attractive. This is because both the factories are in fruition according to the “Original Concept of Smart Factory as a Whole” proposed by “Industrie 4.0”, and importantly, the former pays the special attention to the “Design Principle of Production Structure”, i.e. the closest linkages among the objective product, available production structure and　production patterns, to a large extent. Of further special notes, primary concern of nearly all smart factories is for the establishment of the lucrative business for the time being by not designing them in accordance with the original concept as a whole, i.e. simplified ones by placing the stress on either “Brains and Nervous System” or “Limbs and Tools” type. CHAPTER 6 As shown in some practical applications of the smart factory within Chapter 5, we must be aware that the production activity should create the wealth for the human society by conducting, in preferable cases, the lucrative business. In fact, it is rare that the original concept as a whole of the smart factory is in fruition, but the smart factory being on work has been established by employing a part of the original concept especially activating its beneficial features, which depends considerably upon the customer’s requirements. In the full application of the original concept, a root cause of difficulties lies in the preferable harmony and chemistry among various reciprocal attributes, which can determine the system characteristics. Obviously, we must establish a smart factory in accordance with the customer’s requirements, and thus a further hindrance is certain uncertainties in such requirements. In addition, such leading attributes ranges from engineering, through economics, to social attributes (see Fig. 1.9). As a result, nearly all production engineers and researchers do not delve into the essential features within a facing problem, but do solve such a problem by the case-by-case way in both FCIPS and the smart factory to some extent. Obviously, the solution obtained by the case-by-case method is very valuable together with high applicability. In contrast, it is desirable that people in the academia should scrutinise in detail the essential features of each R & D (Research and Engineering Development) subjects and could transfer the valuable achievement into the practice after conducting an innovative research. Paraphrasing, we may appraise often the well-intellectual backup method rather than the experience-based remedies to solve the engineering problem. In many respects, we must investigate leading R & D subjects in FCIPS and the smart factory in consideration of their essential features, and this chapter will place the stress on the technological subjects. On the basis of our long-standing experiences for FCIPS and investigation into the crucial problems in the smart factory, we first analyse and suggest some leading R & D subjects in both FCIPS and the smart factory, and then some representatives in such subjects will be detailed and discussed herein. Of note, Chapter 7 will discuss the R & D subjects within manufacturing culture and industrial sociology aspects. CHAPTER 7 So far we have been demonstrated the potentials of flexible manufacturing technology that is currently available or in the process of development for convertibility towards CPS Module in the smart factory. We have seen that an important factor of the ‘Industrie 4.0’ strategy is the preservation and continuous further use (and improvement, i.e. the “elevation” of technological potentials) of already existing smart production technology and to include these technologies in the emerging structures of the smart factory. Obviously this requires migration strategies towards the smart factory. But since the existing technological components are not sufficient to implement the concept of ‘Industry 4.0’, the pathway to this end is thus both, evolutionary and also radical innovation. And it is very likely that also the work organisation and qualification structures of the smart factory can not only be thought of as an evolutionary continuation of today’s structures, but also require radical re-thinking. This Chapter will address the so far unexplained relationship between the technology of the smart factory and the organisational and qualification aspects of production under the conditions of ‘Industrie 4.0’. In popular debate, this often reads as follows: Will the smart factory revolutionise the world of work? Or: Will ‘Industrie 4.0’ demand completely new qualifications of the work force? These and other questions will be taken up and answered tentatively. The focus will be on requirements for work organisation and qualification in the areas of design (construction) and manufacture. This means that on the one hand engineers are targeted and on the other technicians and personnel at shop-floor level. The former see themselves as developers of smart production systems, the others as implementers and maintenance personnel exposed to the newly arising challenges.